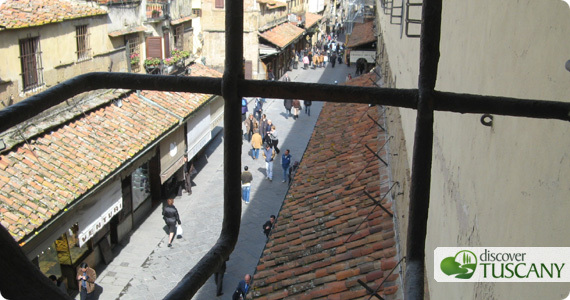 Yesterday we had news regarding the official re-opening of the Vasari Corridor this April, closed just last February for a restoration project that is supposed to last years. A trial period from April through June was announced which will see the reinstatement of the striking “Percorso del Principe“, or Prince’s Itinerary. The itinerary will lead visitors from Palazzo Vecchio to the Boboli Gardens passing over Ponte Vecchio along the Vasari Corridor passageway, an itinerary available to the public from 1997 through 2003.During this trial stage, the Corridor can be visited only through prior reservation just on three days of the week: Wednesday at 10.00 and 11.30, 15.00 and 16.30, Thursday at 10.00 and 11.30 and Friday at 15.00 and 16.30. A ticket will cost 19,00 euro (includes 4 euro reservation fee) and begins in Palazzo Vecchio. The tour includes a visit of the Palazzo Vecchio Museum, the Vasari Corridor and the Boboli Gardens. At the moment, reservations are not yet open since the reopening is still being organized. We’ll keep you informed over the next few weeks as we learn more.